A strategic initiative leader is a story teller. The story being told looks into the future; it is a prospective story about stakeholders receiving a stream of future benefits. My audiences continue to tell me that they find the chief story teller role a new and compelling idea. I’ve provided a number of practical ideas in earlier articles (click on the “How to Improve Your Story Telling Chops” category on the right). In this article, I provide a tool for helping others to engage with the bigger picture. There are two basic kinds of narrative*. In the heroic narrative, the central struggle is for discovery of a “new self.” The heroic narrative is most applicable for strategic situations where you are looking for growth: new business models, entrepreneurial opportunity. In this narrative, the hero heads off on a quest, often accompanied by a team of fellow travelers. They travel into the unknown and experience personal changes through the journey. For more, see my earlier article on the heroic quest and the call for action. In the romantic narrative, the central struggle is for a rediscovery of the “purer self.” The basic structure is for the romantic narrative structure is resembles a religious awakening: Our organization was once pure and filled with wisdom, grace, energies, and fruits of our founders. Over time, we became alienated from those values and it is necessary to atone for falling away. Even more importantly, our task is to return to our original (presumably true and natural) selves. Let’s stop and put that in more concrete and less mythic terms. Successful organizations, over time, necessarily get more complex as a result of growth. With complexity comes specialization, bureaucracy, entitlement, and impersonal relations. It’s not surprising, then, that “back to basics” is a frequent theme of strategic initiatives. As I explained in this article, it is useful to constructing a timeline that displays the major events in the organization. The strategic initiative is a turning point. “we were staying together as a world-class integrator” and it “signaled that we were a very different company – able to change and make bold decisions, just as we had done with the decision to consolidate; able to move quickly; able to take risks and do innovative things; and we were more accessible.” (See Even Giants Can Learn to Dance, page 92). How have you used narrative ideas in your leadership? * Acknowledgement: The ideas here originated in an academic paper by David Barry and Michael Elmes, Strategy Retold: Towards a Narrative View of Strategic Discourse. 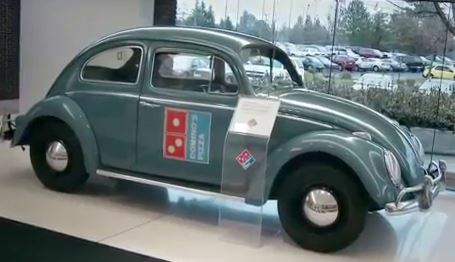 This entry was posted in How to Improve Your Story Telling Chops and tagged Domino's Pizza, story teller, story telling. Bookmark the permalink.